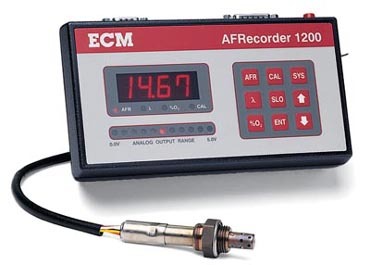 The AFRecorder 1200 is a highly integrated, full-featured, and extremely compact air-fuel ratio (AFR) analyzer. Although it is only about the size of an unfolded wallet, the AFRecorder 1200 packs features such as a linearized programmable analog output, RS-232 control, a programmable SEGO output, and recording with built-in statistics. The AFRecorder 1200 is DC powered and comes with an external AC/DC adapter and a carrying case.